In just a little over a week… join Mt. Vernon Manor CDC, The Enterprise Center, People’s Emergency Center (PEC), Division of Housing and Community Development, City of Philadelphia, and other partners for an awesome Health Is Wealth Workshop! 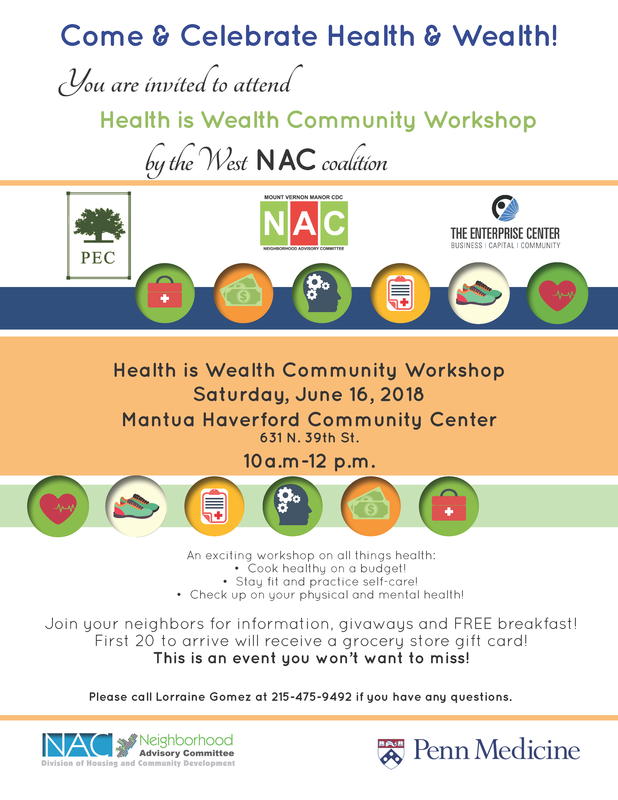 It’ll be Saturday, June 16, 10AM-12PM, in the Mantua Haverford Community Center. We’ll be talking about nutrition, self-care, staying fit, and checking on your physical and mental health. See you there! Previous Previous: April 9 East Parkside Community Workshop! Next Next: July 27 Community Fun Day!